Rockwool is a horticultural growing media made from the natural ingredients Basalt rock and Chalk. These are then melted at 1600° C into a lava which is blown into a large spinning chamber, which pulls the lava into fibers like "cotton candy." If you have ever visited a volcano you have probably seen these fibers flying around in the air surrounding the volcano. Once the fibers are spun they are then compressed into a mat which is then cut into slabs and cubes. 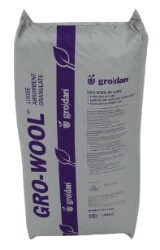 The rockwool granulates are just bales of uncompressed fibers. The process is very efficient, producing 37 cubic foot of wool from 1 cubic foot of rocks. Since rockwool is born in fire it renders the product chemically and biologically inert and creates the ideal growing medium for hydroponics. Since its development in Denmark in the early 1970's, rockwool has become the major vegetable and flower production medium throughout Europe and North America. 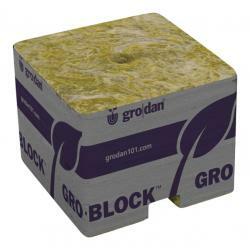 Horticultural Rockwool growing media is primarily available in two general formats. First, as rigid slabs, blocks, and cubes known as "bonded" products because the fibers are held together with a "gluing" or binding agent which renders them stiff and brittle. This is the primary format for the vegetable and cut flower industries. Secondly, rockwool is available as a highly refined and consistent hydrophilic or hydrophobic granulate which is basically water absorbent or water repellent. This format can be used as a component in various peat moss based soilless media or for ground bed incorporation to improve the tilth of heavy clay or light sandy soils. The formed products are available in various sizes and shapes which are adaptable to many applications. 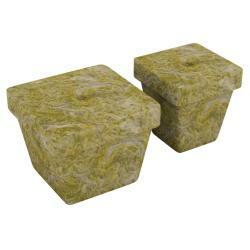 We offer various sizes of seeding and propagation cubes and plugs, blocks and slabs. The most important characteristic of all formed rockwool lies in the fact it allows growers to quickly respond to fluctuations in the plant's rooting environment. The rockwool being an inert media means that rockwool fibers do not modify or restrict the availability of nutrient to the plants. Due to this zero Cation Exchange Capacity (CEC), the material can be leached of all fertilizer "salts." In addition to this, rockwool possesses a near-zero absorption capacity for water, thus allowing more water to be available to the plants when compared to production in soilless media. Of the total amount of nutrient solution applied to a rockwool slab, only 2% is unavailable for plant uptake. Organic media such as peat moss and sawdust, possess a 65% water holding capacity and nearly 4-8% of the nutrient solution is absorbed to the colloidal structure of the material and hence is unavailable to the plants. 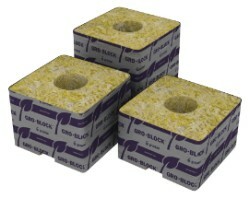 Due to the unique pore structure of the rockwool, it can safely receive large volumes of nutrient solution without leaving it water logged. After excessive soaking, the slab, block or cube will drain sufficiently, in a short period of time, so that 40-50% of the pore space is occupied by air. Deliberate leaching of the slab with excessive nutrient solution can be used as a management tool to control crop health and maintain optimum growing conditions in the root zone. Multiblocks are designed for seed and cutting propagation prior to "blocking on" into the larger growing blocks. Multiblocks are a free standing module type growing system. The V-shaped individual "cells" within a multiblock sheet allow effective air pruning. this encourages rooting within, rather than between, individual blocks. All multiblocks come in 1.4" blocks and fit in a standard 10x20 propagation flat. Miniblocks are used for seed and cutting propagation also like the multiblocks. The difference between the two are the Miniblocks are square and are wrapped in white UV resistant plastic on four sides which helps maintain moisture. These blocks may also be transferred into larger Growblocks by tearing off the plastic and sliding them into the pre-cut holes in the top of the Growblocks. The Miniblocks come in convenient bags consisting of two strips containing 15 blocks per strip. Growblocks are used for direct sowing or "blocking on" of Multiblock and Miniblock raised plants. Just root or sprout in the smaller blocks and transplant into larger blocks once the roots begin to become exposed and the plants will root right into the larger blocks. The blocks are individually wrapped in UV resistant white plastic on four sides and supplied in convenient tear away strips. The base of the Growblocks are grooved to promote uniform and complete drainage preventing the occurrence of root rot. If the plant begins to become root bound in one of these Growblocks you can either place the block right on top of a slab and let the plant root into the slab, or you can stack the cubes on top of each other. These come in a wide variety of sizes ranging from 3" side to 4" wide and up to 4" tall. 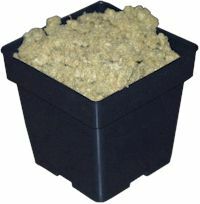 These Growblocks work excellent in all ebb and flow or drip hydroponic systems. All Growblocks are sold in packages containing strips of blocks which vary in the amount of blocks according to the size of the Growblock. Slabs are the premium product for vegetable cropping. 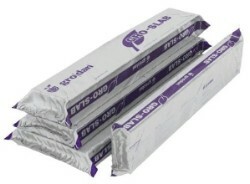 They are available wrapped in UV resistant polyethylene sleeves for ease of use. The special structure provides a uniform environment allowing plant roots to rapidly explore all the available growing volume for a quick start. Water and nutrient distribution is also more uniform and provides a larger effective rooting volume than previously possible. Slabs come in 36" lengths and 3" heights and have two different sizes of widths. The 6" slab is suitable for crops that do not tend to require a very large root capacity. The 8" slab is mainly for extremely vigorous crops such as cucumbers that require a strong and stable base and a large root capacity. The Slabs are easy to use just cut holes in the top of the slab set your cubes on top and cut a few slits in the bottom of the slab's plastic for drainage. Granulated Rockwool can be used alone in pots or as an amendment to organic based mixes. Water absorbent granulates can be used as a substitute for peat in media where the peat breaks down rapidly such as in orchids and bromeliad production or in cases where disease transmission in peat is rapid. The addition of water absorbent granulate to peat mixes at 20-50% volume increases water holding capacity and aeration, improving plant growth and shelf life. It is recommended for use alone or mixed with water repellent granulates, depending on the air/water ration required. The water repellent granulates are substituted for aerators such as perlite and styrofoam. Granulated rockwool will not break up under severe soil mixing the perlite or vermiculite do and it can withstand the heat of sterilization under conditions that melt styrofoam. We sell a 30 lb bale of a 50/50 mix of both absorbent and repellent mixes.